Collect dust, smoke, fumes and other airborne contaminants with a practical, energy-efficient solution. Rated from 2,000 to 3,000 CFM. 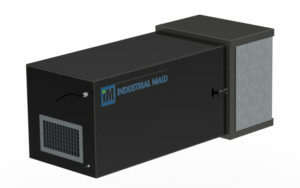 The commercial air cleaner / commercial air filtration system is designed for collecting dust, smoke, fumes and other nuisance dust from lighter loading applications. 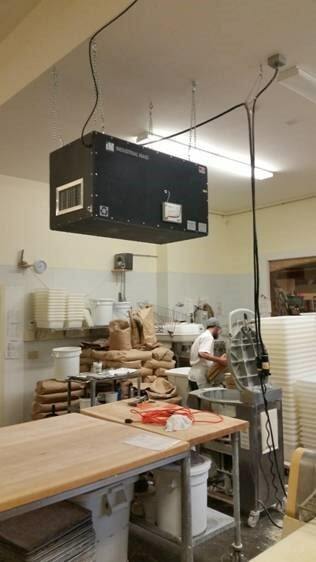 This solution is ideal for schools, bakeries, print shops, IT centers, wood shops and others. It continuously recirculates air to collect harmful particulate, smoke and vapors that have become airborne in the workspace. The below specifications overview features available on the product series, not all features are available on each product, please contact us for more details or questions. Additional model options include a silencer, eyebolts, manometer and MERV 11 bag filters. Check out the specs, add to your cart or contact us about what air cleaner is right for your needs. Some of the most popular applications for the self-contained commercial air cleaners are 3D printing, art studios, bakeries, print shops, wood working and many more. Different filter configurations can be placed in these units to suit almost any application. Determine the AER – Air Exchange Rate from Table 1 that best fits your application needs. Note – we use dimensions only to 20 feet as smoke, dust and fumes will stratify well below this height. Example: 24 ft ceiling height—20 ft.
Divide the total cubic feet by the AER determined in Step 1. Divide this total by the CFM of the unit you prefer to use. 2,400/2,500 = .96 or 1 unit(s) to handle the application. Determine best location or placement for units. *Source capture may be required to meet OSHA, PEL or TWA requirements. General guidelines only, consult factory for specific details. Our experience and commitment to commercial air purification has brought us to where we are today – manufacturing complete air filtration systems & industrial ventilation products that provide the best performance, efficiency and capacity for the money. 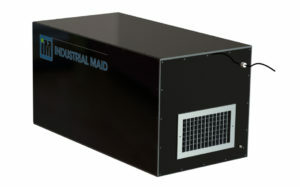 At Industrial Maid we strive to be a full line provider of all your industrial air filtration needs. 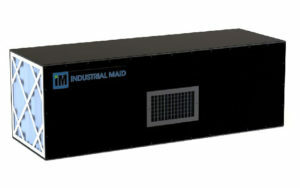 When comparing air filtration systems, we guarantee that Industrial Maid equipment gives you the best dollar value in the industry. 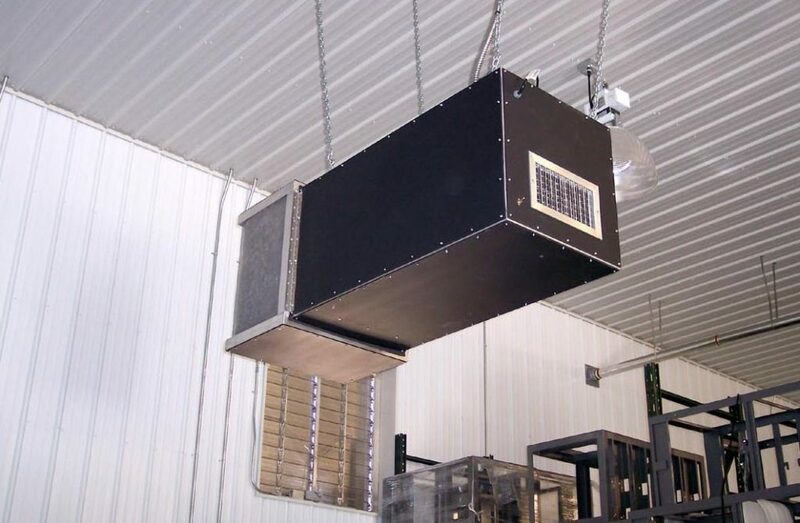 All of our industrial ventilation units are manufactured at our plant in Cortland Nebraska and our customers trust that every product we sell is of the highest quality in both design and construction. Listening to our customers has made our engineering team keenly aware of how important it is to maximize return on investment. 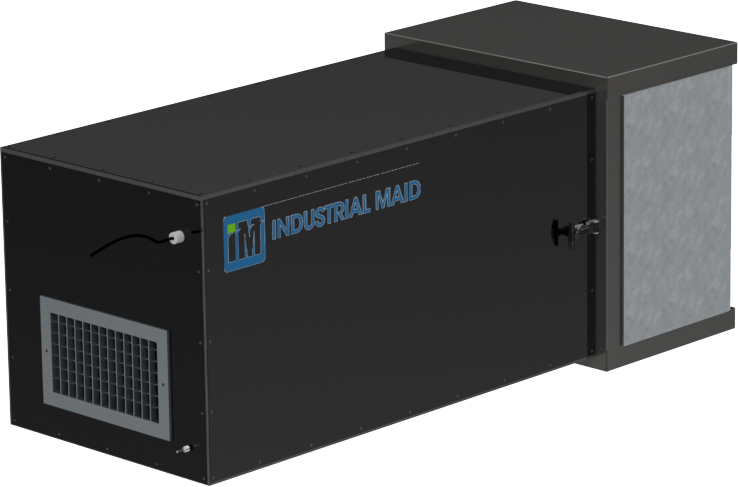 You will find that all Industrial Maid air cleaners are designed with close attention to achieving low maintenance costs and extended service intervals without compromising airflow and efficiency.